It needs to taste OK cold or at room temperature. You have to be able to eat it without a fork and spoon. and my kids have to like it! We have a few go-to, to-go meals like this (lol). 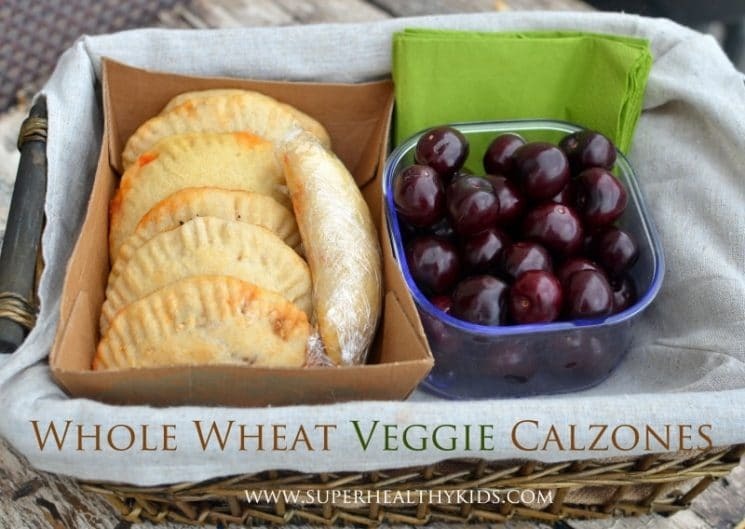 Our veggie burritos here and these whole wheat calzones! You definitely need to make these ahead of time. But once baked, keep wrapped in the fridge till you are ready to go. 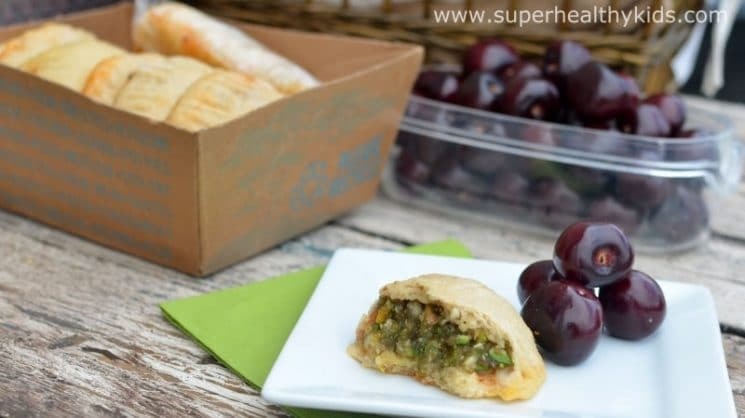 You can also freeze these after they are baked, but then you will need to re-bake them when you want to bring them somewhere. To make the calzones, first make some pizza dough. Pizza dough is much quicker than traditional bread dough. We only let it rise about 30 minutes. You don’t need to let it rise longer than that, as you don’t want a super thick and fluffy dough. Then, we took some veggies (we chose peppers and zucchini, because that is what is in our garden right now), and we pulsed them in a food processor. Using HALF of the zucchini, and half of each pepper, and 1/2 cup mushrooms, we got 1 1/2 cups of veggies. Then we stirred 1/2 cup of mozzarella cheese into the veggies. With our dough and veggies ready to go, we scooped a small amount of marinara sauce and a scoop of veggies on each flattened out ball of dough. We folded the dough over and crimped the edges. Then, using a pastry brush and egg whites, we brushed the top of the calzone before baking. Then we baked our calzones at 425 degrees for 10 minutes. 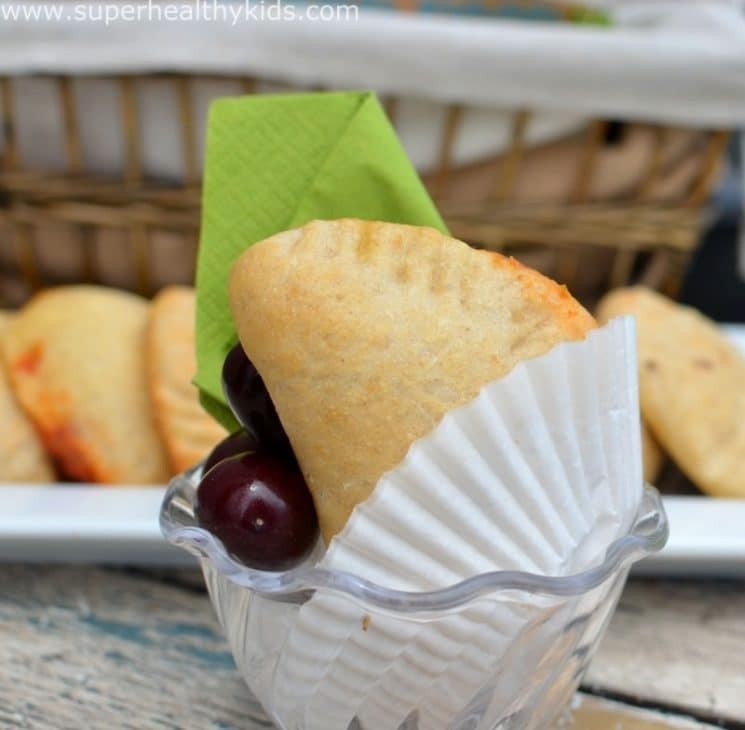 We made mini calzones, so 10 minutes was all that was necessary! 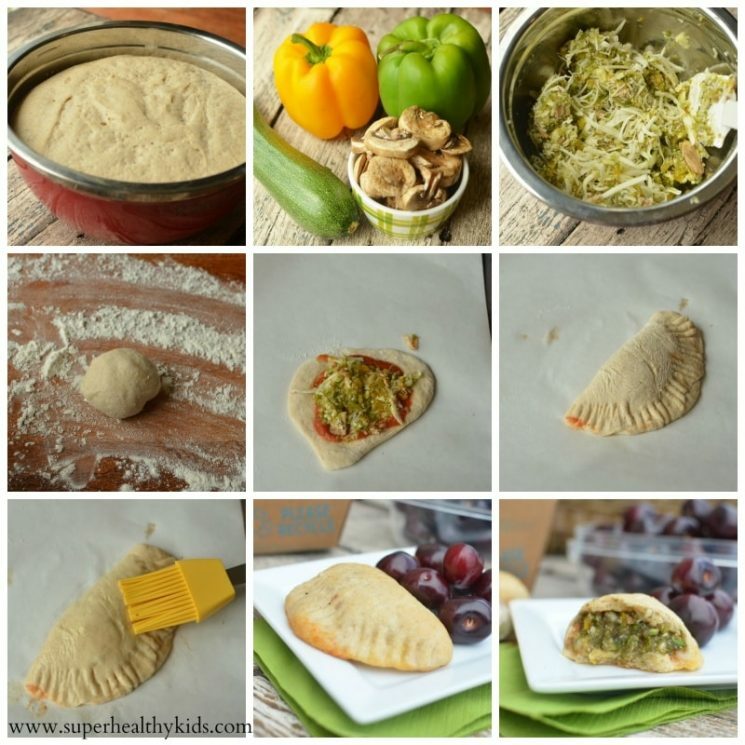 Calzones make it easy to get those veggies in for dinner! I like chopping them up super small this way, so it’s easier for little ones to eat. Print the recipe below, and have some on hand for that next super busy day that you need to pull them out in a pinch. Combine yeast, sugar and warm water and let set for 5 minutes. Mix remaining ingredients and then add yeast mixture. Let dough rise, in a warm place, for about 30-45 minutes. In the meantime, peel zucchini if desired, and de-seed bell peppers. Put zucchini, bell peppers and mushrooms in a food processor or blender and pulse until blended. Stir in 1/2 cup of shredded mozzarella cheese into the veggies. Roll out a small portion of the dough at a time, for mini calzones we use a golf ball size. Roll or press out. Fill middle with filling: thin layer marinara sauce, and a scoop of veggies. Fold calzone in half and then crimp edges with a fork. Set on baking tray. Whisk 1 egg white in a small bowl. With a pastry brush, brush the top of the calzone. Bake at 425 for 10-15 minutes until lightly browned. Test to make sure dough is done baking by tapping on it. It should sound hollow. Let cool slightly and serve with marinara sauce for dipping. These sound amazing! Is there anything that I can substitute for the egg white? My son has an egg allergy. This looks delicious! My husband cannot eat eggs though. Could I substitute butter on top instead, or not brush anything on top? I wasn’t sure what the egg white was for. Is it just to make it look nice and glossy? Or slightly crispy? Thanks for letting me know! I love your helpful website! That Looks amazing. Do I cook the veggies first ? O just purée them raw. Can you make this with gluten-free flours? If so, what would you suggest? These look awesome! My kids love pizza so I can see these being an great portable option. Thanks! My mother made these when I was a kid. She made them with a blend of shredded carrots, brocalli and cauliflower and Added mozzarella. They are incredible! @Sabina and Alisha- Yes, I would just use butter.. The egg white is just there to make it crispy and glossy. But Marissa and Marlena have a good idea too! @Paola- no cooking- we just put them in raw. Thanks for this link. 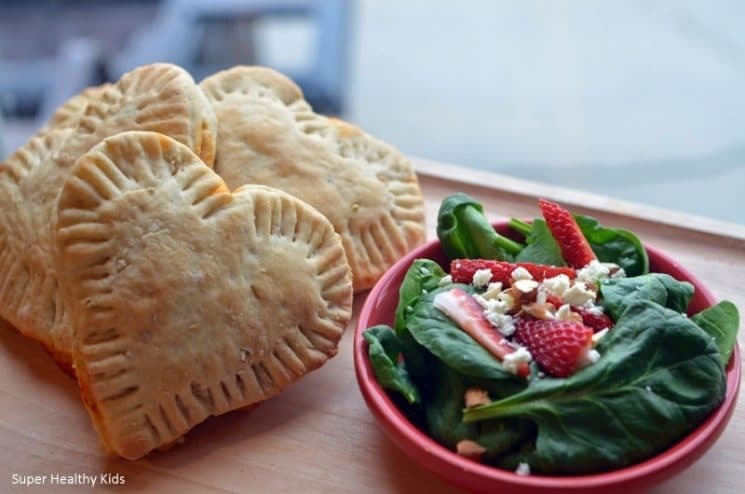 Would you recommend doung the intial cook cycle prior to making the dough pockets? GF dough is usually really sticky but maybe it would hold together to form the pockets without the inital cook…thoughts? I’m not sure how that works Jessica. I would try to follow the recipe here and not cook prior to making the pocket. I don’t know if you could make a pocket with a dough that is cooked already.???? Sorry I can’t be more help. very yummy !! 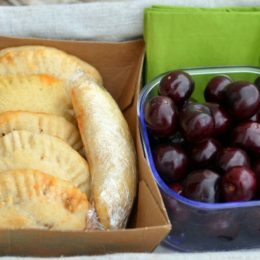 i tried it yesterday for my 21 months son he loved it 🙂 I add kalamata olives to the filling instead of salt since my son loves them! The only thing is i crimp the edges with a fork but they all opened up! not sure what i did wrong!! They were probably just too full Areen- use less filling next time, or make your dough circles bigger. Can i replace yeast with baking powder? The yeast is important for letting the dough rise Sal. Going to make these tomorrow! Have you ever frozen them? Yes Monica- they freeze and reheat just fine. I’m keen to try these for my two boys! Do a bake the whole batch and then freeze those I’m not going use. Or can I freeze them before baking? Awesome Jo!! Thanks for checking back in. Yes you bake them all and then freeze them. Can you put fruit in three? If so, what works best: fresh, frozen or preserves? Looking forward to making these! Sure you could Lauren! In fact, some cream cheese and fruit together might be amazing! Hi, can we make this in ready biscuit dough when running short of time.. Which other veggies do you suggest? I would like for my husband to taste them as well but he’s allergic to mushrooms. Thank you in advance! Any veggies you like on pizza would be great in a calzone. Leave out the mushrooms and add onions! Can I use the quick rise yeast? @Gill- yes, I’ve used instant many times. @sam I’ve used both. If you proof the yeast, it should rise enough. Made these for my daughter and she devoured them. As a special one, made one with plain mozzarella and not to mention that was the favourite! I used a milk wash on top and slathered some butter before giving it to her. Hi there! About how many mini calzones would you say this recipe makes? Hi Melanie! It should make about 6-8 mini calzones. I think I failed on the dough! I followed instructions, but it didn’t rise. Or I don’t think it did?? Any tips on what the dough should look like when it’s ready? (I did make them from store-bought dough–so far, a hit:). But would like them to be more homemade!). Kate! Pizza dough shouldn’t rise much at all. It just turns into bread if it does! So, a low rise is ideal! Ah! Okay; thanks–maybe it **did** rise. Will try again this weekend. Thanks for great recipes.